The average numbers I found were 47" for Nashville and Knoxville, 53.68" for Memphis, and 52-54" for Chattanooga depending where I looked. I was kind of surprised to see a 6-7" annual difference between Nashville and Memphis. The more you know, I guess. 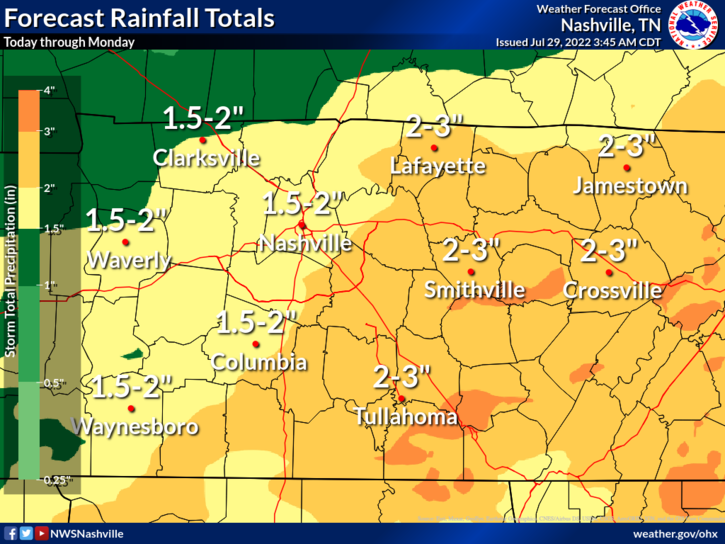 There is a gradual decrease in average precipitation as one goes further north in TN and KY (minus effects due to the mountains in the eastern portions of those states). The vast majority of western and central Kentucky averages less than 50 inches and the counties along the Ohio River only average around 42". 4.85" of rain IMBY this week. Unfortunately we had a 22" deficit before it started, so we have a long way to go. Been a rough couple of weeks around here between the fires, storms and the bus crash. Athens tornado was EF2, Marion tornado was also EF2. Ocoee tornado was EF3, Ider tornado was also EF3. Worst outbreak in this area since the Super Outbreak. That doesn't sound right. Most of TN doesn't even average 47 inches per year. Chattanooga is the wettest major city at 54.